A few years back we noticed that there were some people attending TED that had to break away from the event to take care of business concerns. There are many ways to engage with the TED space, but at that point people had to physically leave the venue to track down usable meeting and work spaces. Time away from TED meant missing featured talks, meaningful unplanned conversations, and chances to meet people from all over the world with every kind of background. Fast forward to the last couple of TEDs and you would now see that there are Workspring “pop-up” centers that are on the same premises. 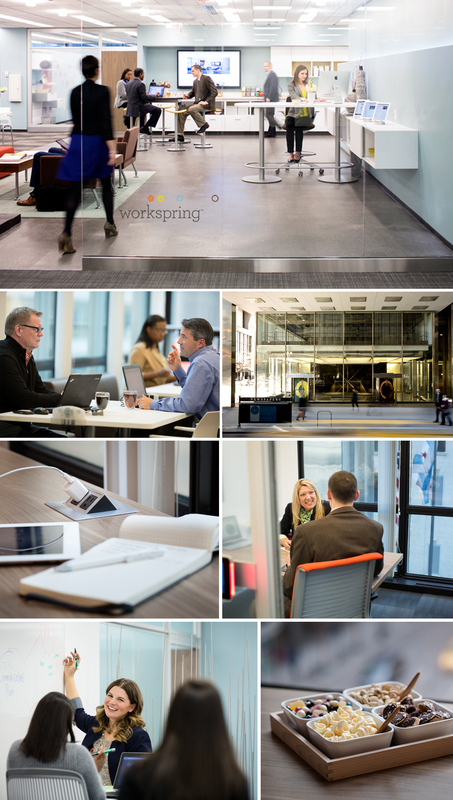 By engaging with the Workspring spaces and hosts, people could now take care of business needs without fully disconnecting from the TED experience. Win/win! TCondon worked with the Workspring team to design the space. We had to accommodate for use by individuals, small teams, and larger groups, all with a wide variety of needs, so we knew we had to build a useful space with a lot of flexibility. We know that the experience people have in a space is not just about the style and arrangement of furniture. While that must be well-resolved, individuals meeting at Workspring need to feel like their time spent there was rewarding and remarkable. So we holistically dug in to everything about the space — we focused on work postures, power and charger access, sharable technologies and whiteboards, and great food options being available to recharge and revitalize. We also dug in to the softer details: music that varied depending on what type of work zone you were in, a variety of lighting approaches, also dependent on the functional area, and ultimately teaming with Aveda to customize soaps and lotions in the restrooms and lounge. We even brought out a few surprises. One day it was extra chilly outside, so we treated everyone to an impromptu hot cocoa break. We were designing not just the space, but the details that rolled in to the entire amazing experience. Who knew it could be so refreshing just to take care of a conference call! Workspring is a hosted Steelcase co-working environment in Chicago, and when they expanded to a beautiful new location TCondon got the call to partner with their architect and construction team to create a dynamic layout that supports individuals, groups, meetings, social gatherings and focused-work needs. Realize, too, that one day there could be 20 people utilizing the space, the next there could be 120, and that the way the space is utilized also varies day-to-day. These realities seem to be, but could not be, contrary to each other. Rather, these needs had to coexist in harmony. TCondon had to develop a solution revolving around high flexibility for layout and use, with furniture and materials that could stand up to being reconfigured, moved, and repurposed. We also needed to be very careful that it didn’t “feel” temporary or impermanent and all the while allowed for comfortable interactions and rewarding experiences throughout. We put on our empathy hats and imagined the many moments that would occur here. We imagined varied use-cases — from the focused, head-down individual laptop user, to a sales team meeting in town for the day, to team-building session attendees enjoying a casual refreshment break after a long day. Wondering for each: “What would I want from this space?”. TCondon designed prototype spaces recently unveiled at a global Marriott Hotels & Resorts event. These spaces envision the future of meetings and work. For this event, we partnered with Steelcase and IDEO to build dynamic solutions that reflect hosted work experiences. Many factors are pointing to mobile, global, and business travel trends evolving the way people will meet, work, socialize, and collaborate. The prototype rooms were very well-received and we love the immediate feedback being generated. Check out these links for more information and stay tuned as the prototypes evolve and we continue to design the future! The comments by Truran are the best reward to the many hours spent creating TEDActive in Palm Springs. Pulling from favorite settings of the past and blending in new ideas created a space to love. A friend gave me this photo of a modern take on a cabana. I immediately thought “I can do that with Steelcase product for Art Center Design Conference.” The beautiful weather in Pasadena allowed us to place the upholstered Ripple benches outside and frame it in with Post & Beam and fabric. Perfect for the evening party on the Plaza. The Grand Rapids airport is getting an update to their business centers. Re-named “Traveler Work Center” and using hot new products from Steelcase. We brought life to the space with a shock of bright blue.